PARASITES of CHICKEN and POULTRY. Summary of the most common external and internal parasites in CHICKENS, TURKEYS, DUCKS, GEESE, PHEASANTS, etc: mites, lice, flies, fleas, roundworms, tapeworms, flukes. PARASITES of CHICKENS and POULTRY. Summary of the most common external and internal parasites in CHICKENS, TURKEYS, DUCKS, GEESE, PHEASANTS, etc: mites, lice, flies, fleas, roundworms, tapeworms, flukes. This article offers a summary of the most common external and internal (helminth) parasites of chicken, turkey, ducks, geese, pheasants and other domestic birds. Detail information on the biology and control (life cycle, anatomy, prevention, chemical control, etc.) of each species is available in specific articles in this site. To visit these specific articles click the corresponding link, or navigate through the menu, or use the site map. «$» to «$$$$$» indicates the magnitude of the economic damage on poultry caused by a parasite on a worldwide basis. The more «$», the higher the damage. Bed bugs. $-RR. Can become a problem in layers and breeders, worldwide. Fleas. $-R. Can become a problem in poultry houses worldwide, sometimes considerable, mainly during hot and humid season. Usually not the first priority. Mosquitoes. $-RRR. 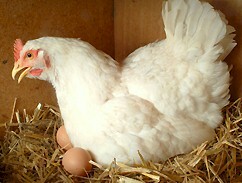 A worldwide problem in all kind of livestock, but usually not a major issue on poultry. Stable flies. $. A potential problem on birds kept outdoors worldwide, but usually not a major threat. Lice. $$. Very common problem worldwide, particularly in layers. Houseflies. $$-RRRRR. Can be a serious problem in any kind of poultry operation worldwide, particularly during the hot and humid season. Filth & nuisance flies. $. Can be a problem in any kind of poultry operation worldwide, particularly during the hot and humid season. Soft ticks. $. Can be a significant problem in tropical and subtropical regions in birds kept outdoors. Mites. $$$$-RRRR. Red mites (Dermanyssus) and Northern fowl mites (Ornithonyssus) can be a tremendous problem in layers worldwide. Acuaria spp ~ Dispharynx ~ Synhimanthus spp. $. Gizzard worms. Gizzard, esophagus and proventriculus. Can be a problem in endemic regions, mainly in birds kept outdoors. Ascaridia spp. $$$. Chicken roundworms. Small intestine. A serious problem worldwide, also in confined operations. Capillaria spp. $$. Hairworms. Crop, esophagus, small intestine, large intestine. Heterakis spp. $$$$. Cecal worms. Cecum. Probably the most threatening worms in all kind of poultry operations worldwide. Oxyspirura spp. $. Fowl eyeworms. Eyes. Usually a secondary problem in individual birds kept outdoors. Strongyloides spp. $$. Threadworms, pinworms. Small intestine. Can be a serious problem worldwide. Subulura spp. $. Cecum and small intestine. A secondary problem in birds kept outdoors worldwide. Syngamus trachea. $$. Gapeworms. Trachea, bronchi. A serious problem in birds kept outdoors in endemic regions. Tetrameres spp. $. Proventriculus and esophagus. Can be a problem in endemic regions, mainly in outdoor opertaions. Choanotaenia infundibulum. $. Small intestine. Usually not a major issue in modern poultry operations. Davainea proglottina. $. Minute tapeworms. Small intestine. Can be a problem in birds kept outdoors in endemic regions. Raillietina spp. $$. Small intestine. The most frequent tapeworm in poultry, however normally not a major problem. Prosthogonimus spp. $. Oviduct flukes. Oviduct, bursa of Fabricius. Can be a serious threat for birds kept outdoors in endemic regions.